A step too far out of prog and heavy rock. 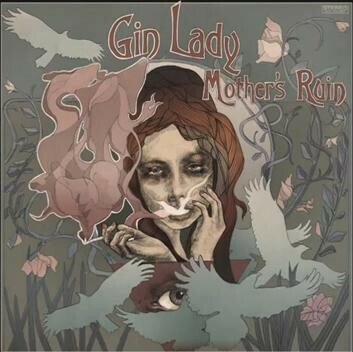 With the benefit of hindsight the debut Gin Lady album found a band in transition, what with the outfit morphing out of the progressively tinged 70's heavy rock inspired act Black Bonzo, into a reasonably straight-up modernising of classic Deep Purple and Uriah Heep. With album number two, 'Mother's Ruin', that shape-shifting is taken a step further with the obvious heavy rock feel almost completely left behind for something altogether more languid. Think The Doors at their most laid back and you'll have a strong idea of where this Gin Lady is drunkenly staggering. Cards on the table, not only were Black Bonzo a band I had a real strong affinity with, but the likes of The Doors never have and never will do anything for me. So truth be told you need to take that into account when I say that on the evidence of 'Mother's Ruin', it may well be with regret that at this stage in our long relationship, myself and the band formerly known as Black Bonzo decide to part ways. Things start well enough with the simple stomp of the album's title track surging with energy and purpose through a keenly attacked riff and simple beat. Add to that an oft repeated chorus line and there's little doubt that you'll be thoroughly hooked after just one listen – I was and still am. However from there the rest of the seventeen song and two disc set settles into a mid paced groove that simply lacks the required drive to hold the attention. Different approaches are employed, but in the end differentiating between the songs becomes a challenge and chore, rather than the joyful experience hoped for. Don't get me wrong, the songs are keenly crafted, the believability of the band beyond question and the sheer 70's authenticity undeniable. So much so that as with the previous (and much more varied and interesting) Gin Lady outing, calling what this band do "retro" would be unkind, instead Gin Lady sound like an act from the early 70's, not an act trying to sound like they're from the early 70's. Some tracks do in fairness hold more sway, the shimmering mix of early Fleetwood Mac and Steely Dan during 'High Flyer' capturing the imagination in an undoubtedly relaxed manner, while 'Listen What I Say' provides a sassy shimmer. Too often however the likes of 'Shine On (Song For Terry)' or 'Learning How To Live' simply meander along without any real sense of purpose. Died in the wool Black Bonzo fans probably lost interest in what their one time heroes were doing with the debut Gin Lady album. However even for someone like me who thought the first offering from this re-branded outfit held a strong and lasting charm, 'Mother's Ruin' is a step too far out of prog and heavy rock, finding instead a place slap bang in the centre of middle of the road blandness.